A Happy New Year to you all! It seems strange to hear that in May, but it was heard several times at Winchester on 4th May! Many enthusiasts and passers by gathered to give this Running Day a welcome at this new May date. The weather was certainly an improvement. Illustrated here is Bristol LL6G KLJ 749, new to Hants & Dorset in 1950. It is unusual in having bodywork by Portsmouth Aviation (DP36R), one of ten supplied to Hants & Dorset in this batch. It is seen at Colden Common, before returning to The Broadway. The interior shot shows the multiplicity of notices displayed on the bulkhead. Very nice photos of a fine bus, but–at the risk of being a tiresome pedant–I’m sure it’s an LL6G. That Garner 6LW makes it really fly along! A very handsome vehicle only slightly let down by the indicator box which looks to be from an earlier era and the slope doesn’t help. It looks to be beautifully restored throughout but what a pity that a modern prohibition sign has been placed on the front bulkhead pillar. ‘elf and safety no doubt rearing its ugly, pedantic head again. Thx for posting a view of this vehicle, Michael, which certainly gets around in its dotage. It’s amazing how shades of art deco remained in coach design for quite a time after the war. Why on earth did Hants & Dorset go to Portsmouth Aviation to body these vehicles rather than ECW, one wonders, although the finished article is attractive. What do we know of Portsmouth Aviation? I know nothing. The reason this didn’t have an ECW body was the length of the Gardner 6LW engine. It required the front bulkhead to be further back and this would be a major change to a standardised body that it appears ECW weren’t prepared to do. As a consequence the numbers of K6Gs and L5Gs were rather limited and all had ‘other’ body builders. The best illustration of the difference can be found in the Pontypridd fleet as they had both Ls and Ks with 5- and 6-cylinder engines, all with Beadle bodies and the difference in engine can readily be seen in the body. I agree with Phil Blinkhorn’s comment re-the indicator box. I can’t help thinking that the effect is made worse by that H&D idiosyncrasy – the sun-visor over the driver’s windscreen. Was it really all that much more sunny in their territory than, say, Southern Vectis just across the water, or Southern National a bit farther west in Weymouth? I guess someone will come up with the reason for this appendage, and the name of him who decreed that all H&D buses must have one! 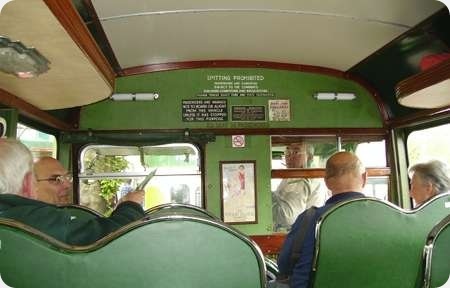 What a superbly handsome vehicle indeed with a glorious traditional high quality interior too. I do agree with Phil that the slope of the destination display might make for difficulty in reading, especially in certain bright conditions, but on balance I feel that the ECW "near vertical" pattern would have spoilt the look of the bus, particularly the flow of the roofline. The ECW type did though, of course, blend perfectly well with the Lowestoft design in what were, in my view, the finest looking and most practical front engined deckers of the postwar era. Chris Hebbron asks about Portsmouth Aviation. I know little about this company but browsed a book about it some years ago. Photographs showed rebuilding of the bodies of some of Portsmouth Corporation’s Leyland TD4’s. Examination of the Company’s website and Wikipedia page shows that it is still in existence but not in the business of bus bodybuilding or rebuilding. Thx, Andy, for shedding a little more light; doing work on Portsmouth Corporation’s TD4’s. They must have been under pressure to farm out work like that. In response to Chris Hebbron’s enquiry about Portsmouth Aviation, here is a bit of information, though the bus industry features only briefly in its history. Portsmouth Aviation was formed on 6 April 1929 as Inland Flying Services at Romford in Essex before moving in May 1930 to a small airfield on the Isle of Wight at Apse Manor, near Shanklin, where it undertook light aircraft maintenance work and offered pleasure flights. Meanwhile, in response to a 1928 government suggestion that all towns with a population of 20,000 or more should provide aviation facilities, Portsmouth Airport, a municipal venture, was developed from 1930 on the north east corner of Portsea Island. The first flight into the new airfield took place on 14 December 1930, although the official opening did not occur until 2 July 1932. Inland Flying Services then transferred its base to the new mainland airport and began operating a local air service to Ryde on the Isle of Wight, adopting the new name of the Portsmouth, Southsea and Isle of Wight Aviation Company. The inclusion of Southsea in the title was purely to encourage seaside custom; there was never an airport there. The Ryde airfield was opened by PSIOWA in 1932, becoming fully operational the following year. The company used typical aircraft of the period, amongst others the De Havilland Moth, Puss Moth, Dragon, Westland Wessex and Airspeed Envoy (Airspeed had transferred its business from York to Portsmouth in 1933). Developing rapidly, the firm began serving a number of air ferry destinations around the south coast, at the same time expanding its aviation engineering, maintenance and repair facilities. With the outbreak of hostilities in 1939, PSIOWA were ordered by the government to cease the flying services and concentrate upon aircraft maintenance, repair and modification duties, and this continued for the duration of the war. With the return of peace in 1946, PSIOWA changed its name to Portsmouth Aviation to reflect its core activities, but took on a wider range of work beyond the air industry. One such new venture was the construction of commercial vehicle bodywork to meet the post war surge in demand. It did, however, design and build one example of the Portsmouth Aviation Aerocar Major, a pod fuselage, twin engined, twin boom machine for a pilot and five passengers. The 1946 prototype was flown briefly in 1947 and exhibited at the 1948 and 1949 SBAC Farnborough Shows. Not having the resources for volume output, the firm made arrangements for series production to be undertaken in India, but the plan fell through, and the machine was scrapped in 1950. The bus bodywork side of the business fared rather better, with deliveries of single deckers on Bristol chassis to Hants & Dorset and Wilts & Dorset, plus others on Bedford OB chassis to the Independent sector. Remedial single and double deck bodywork attention was undertaken, including some Aldershot & District Dennis Lances and Portsmouth Corporation TD4s. 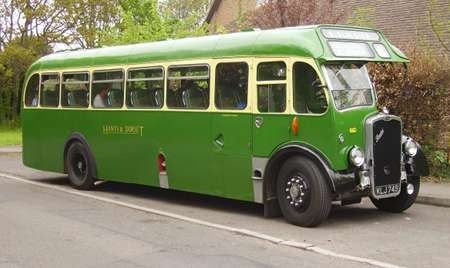 Some Hants & Dorset lowbridge utility Guys are said to have been rebodied by the firm, but it is probable that the original Brush bodywork was rebuilt. In 1950, Portsmouth Aviation, like many others, dropped out of this declining market to concentrate on aviation and military business. The firm still exists on the site today, but this is not the case with Portsmouth Airport itself which closed in 1973 after some accidents that were attributed to the its inadequate size for modern aircraft. At that time it was the last significant commercial airport still relying upon a grass runway. More than I could have hoped for, Roger, many thanks. FWIW, The airport was doomed when, during a wet summer and soggy grass, a Hawker Siddeley 748 on Channel Isles’ service skidded almost onto the dual-carriageway Eastern Road arterial road into Portsmouth, with its mate almost doing the same thing 45 mins later! Aircraft this large were banned shortly afterwards and another operator used three Twin Pioneer planes, painted red, blue and yellow, but not big enough to be profitable. This proved to be the airport’s deathknell. There was the opportunity to buy the closed Thorney Island RAF Station nearby, but Portsmouth Council said No and the more sensibly-sited Eastleigh (Southampton) Airport has taken over the mantle.